Rich, creamy, buttery, both subtle and tangy in taste. This lactis Brie (not stabilized) ripens from the outside in. While young, the core may be firmer (never chalky) and as it matures the interior becomes smooth and flowing. 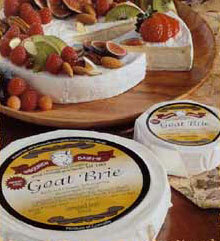 A natural and authentic Brie made with 100% goat's milk and rennet free. Available in large and small wheels wrapped in white breathable paper. Woolwich Dairy Inc., 425 Richardson Rd., Orangeville, ON L9W 4Z4. Tel: 519-941-9206; Fax: 519-941-9349.